Officials at Lancashire County Cricket Club have said they are delighted the Ashes will return to their Old Trafford ground in 2013. The England and Wales Cricket Board announcement for the 2013 Ashes series follows the club's first County Championship win in 77 years last week. The loss of Ashes status was one of the catalysts to the club's £32m redevelopment of its ground. Lancashire also had to spend £1.6m in a legal wrangle over the plans. Geoff Durbin, the club's commercial director, said: "It's been some week, this is quite incredible." He added: "People have worked very, very hard for this moment. "It's quite humbling, this is a victory for the people of the North West who come to us time and time again for international cricket and for domestic cricket." The club became embroiled in a legal dispute with Derwent Holdings, the company owned by Isle of Man-based millionaire Albert Gubay, which challenged the planning permission for the ground's renovation. The redevelopment is due to finish in time for the 2013 season. Lancashire argued in court it needed the ground upgrade to regain the Ashes status it lost in the 2009 series and to secure its long-term financial security. The Court of Appeal rejected in July Derwent's application for a judicial review of the planning permission. "The spectre of Derwent and Gubay seems to be distant now," said Mr Durbin. 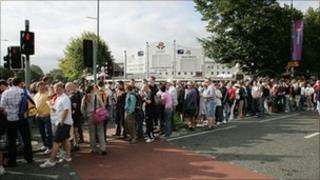 Lancashire last hosted an Ashes Test in 2005, which was a sell-out, with thousands of people locked outside on the final day.